I had difficulty installing Cassandra, and had used brew install cassandra, installed DSE from datastax, and downloaded a binary from Apache. I think the issue was the result of having a previous installation that wasn't properly uninstalled. My user .cassandra directory had some default configs, that must have been for a different version, and prevented cqlsh from starting. After that, I could run cqlsh properly. Cassandra 3.0 and later require Java 8u40 or later. After installing Java 8 it worked. Cassandra-2.1 uses 9042 as cqlsh port.Connect on this it is default port.If you want to connect on 9160 port then change it by setting environment variable CQLSH_PORT and CQLSH_HOST but for setting this you have to change rpc_port from default 9160 to any other port. This is just one of the reasons for the error "Connection error: ('Unable to connect to any servers',". 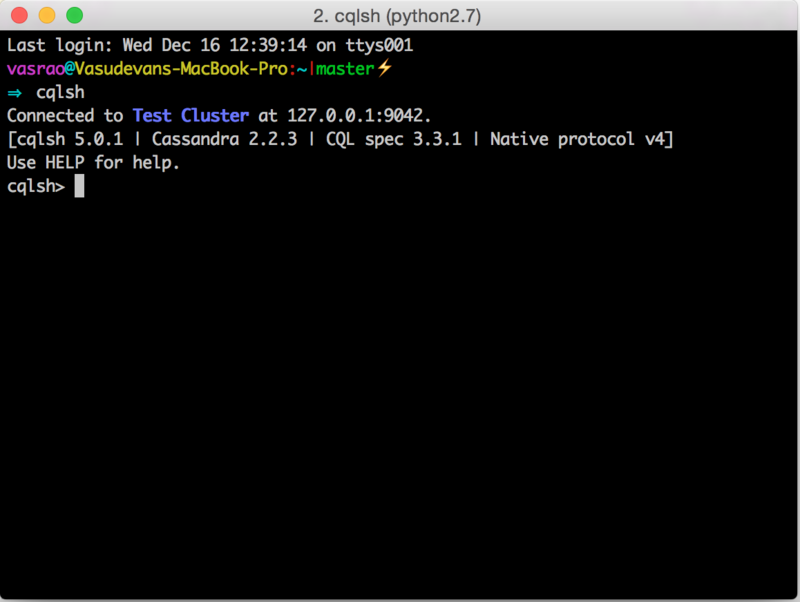 When I used the cqlsh client compatible with Cassandra 2.0.1, I was able to connect to the cluster. Hope this helps to find the root cause. Well, I faced same issue and this is what i did on Mac. Or wherever your cassandra is installed. this initializes all configuration in your local system to start cassandra. This lets you enter cql query mode. Note that, the values in all these fields must be same. That means, if you are pointing to a static IP, then the same IP should be used. And if you are just pointing the localhost, then localhost must be used in all fields. I followed this tutorial http://www.datastax.com/2012/01/working-with-apache-cassandra-on-mac-os-x (which is somewhat outdated). Ran into errors during the install but the install went through. Again following the tutorial above, tried running the ./datastax-agent program and it failed. Decided to just bag it so ran their uninstaller in their installation folder. Tried to go back to original cassandra folder (what I had working in step 2) and run "sudo ./cassandra" then I started getting JMX error (message "Unable to bind JMX, is Cassandra already running?") which led me to this link about changing the port which i did (not really fixing the issue but working around it) run two cassandra versions in the same machine. Got the server service running underneath a new port but when trying to connect with the client "sudo ./cqlsh" would not work (would get "Error=none" or destination not found). Did the remove step @Peter mentioned above and tried again and still did not work. Decided to go back and see what was holding onto the original port cassandra was using which I changed in step 4 Who is listening on a given TCP port on Mac OS X? Determined that JAVA.app was hanging onto it so killed it within Activity Monitor. Reran the remove command @Peter mentioned above again and decided to download the stable release (v2.0.13) instead of the dev release and walk through the tutorial from step 1 again. Exited and re-opened terminal. Ran "sudo ./cassandra" - worked perfect running under standard ports. Open another terminal window and ran "sudo ./cqlsh" and this also worked correctly. I believe between Java hanging onto the default port 9042 (maybe from the DataStax install errors), version/host/port settings within ~/.cassandra/cqlshrc and using the dev version of cassandra these were all causing me fits. and then invoke cassandra. 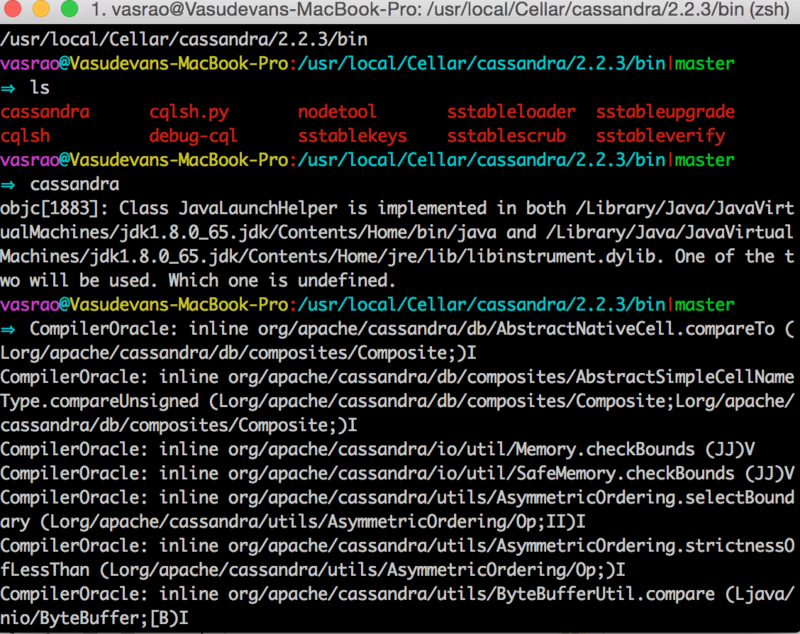 Then opened a new terminal and typed cqlsh the Cassandra started. Hope this may also applicable one to resolve Cassandra issue. And editing below configs to current IP address (192.168.1.6) of the machine I am running. In my case it's my MacBook. install java jdk and Set JAVA_HOME in Environment Variables or set JAVA_HOME = java path in command prompt. I was having the same problem with Cassandra configured with SSL. cqlsh --ssl Solves connects correctly.